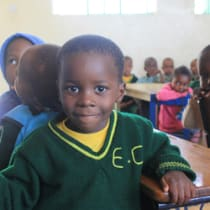 Help us raise money for the Elizabeth Center in Kolila Village Tanzania so that they can be more financially independent and meals and school materials can be provided for the children. We started the initiative as we will climb the Kilimanjaro on October 3rd and want to give something back to the community as they are in urgent need for it. The Elizabeth Center was founded by the Sisters of Charity of Saint Charles Borromeo in 2005 to serve the villages around Kilimanjaro International Airport. The center has grown from a one-room red brick building to a full service nursery and primary school with extensive facilities. In October we will visit the school with our Reaching Peaks group of 16 people to donate the money.